Mickey's Musings: Happy New Year's Eve! We wish you all much happiness in 2019! Happy New Year! I'm sure this one's gonna be great! Happy New Year, y'all. Hope it's a good one for everybody! Happy New Year’s Eve dear friends! I love your festive graphic! We raise our niptini here and wish you all a happy and fun new year! 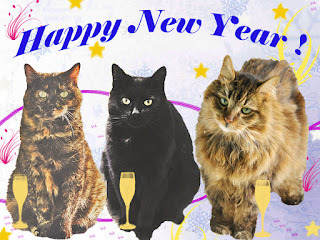 Happy New Year dear Furriends. We'll probably be asleep at midnight, but here's to a Happy New Year! A very Happy New Year to you too. We thank you for visiting us too. You all have a wonderful and Healthy New Year. Wishing you nothing but the best in 2019! !